Chicago – Just in time for Wimbledon, Wilson Sporting Goods Co. is releasing a limited edition Roger Federer Super Six racket bag. As Federer steps on the court to win his 13th Grand Slam and 6th Wimbledon title, he will be supported by a Wilson limited edition racket bag. Federer will carry this rare memento of his Grand Slam career for his first 2008 Wimbledon match, at 2:00pm on June 23rd. This limited edition Super Six bag is made from high quality materials and will be produced in limited quantity. It provides Thermoguard™ and Moistureguard™ compartments to protect your rackets from the elements on and off the court. Thermoguard™ is a patented technology which helps to insure string performance. The design of the bag incorporates the traditional Wimbledon white and Wilson red. It also features aspects of Federer’s origins with elements of the Swiss flag along the edge of the bag. 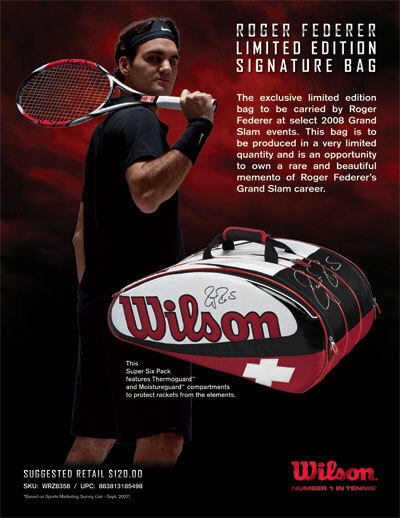 This year’s bag includes several embroidered components including Roger’s signature as well as the Wilson script logo. This limited edition bag will begin shipment this week and will be carried by Federer through the 2008 US Open.